1 Every rectangular parallelogram is said to be enclosed by two straight-lines that enclose the right angle. 2. but in any parallelogram, let any one of the parallelograms about its diameter with the two complements be called a gnomon. Prop. 1: If there are two straight lines, but one of them is cut into however many sections, the rectangle enclosed by the two straight-lines will be equal to the rectangles enclosed by the uncut straight-line and each of the sections. Prop. 2: If a straight line is cut, as it happens, the rectangle enclosed by the whole and each of the segments is equal to the square from the whole. Prop. 3: If a straight line is cut, as it happens, the rectangle enclosed by the whole and one of the segments is equal to the rectangle enclosed by the segments and by the square from the just-mentioned square. Prop. 4: If a straight line is cut, as it happens, the square from the whole is equal to the squares from the segments and twice the rectangle enclosed by the segments. Prop. 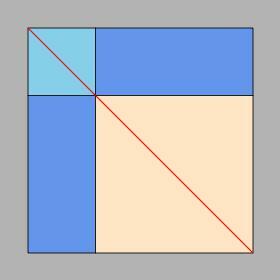 5: If a straight line is cut into equals and unequals, the rectangle enclosed by the unequal segments of the whole with the square from the line in between the cuts is equal to the square from the half line. Prop. 6: If a straight line is bisected and some straight-line is added to it on a straight-one, the rectangle enclosed by the whole with the added line and the added line with the square from the half line is equal to the square from the line composed from the half and the added line. Prop. 7: If a straight line is cut, as it happens, the square from the whole and that from one of the segments, both squares together, are equal to twice the rectangle enclosed by the whole and the mentioned segment and the square from the remaining segment. Prop. 8: If a straight line is cut, as it happens, quadruple the rectangle enclosed by the whole and one of the segments with the square from the remaining segment is equal to the square from the whole and the mentioned segments described up as from one line. Prop. 9: If a straight line is cut into equals and unequals, the squares from the unequal segments of the whole are double that from the half and the square from the line between the cuts. Prop. 10: If a straight line is bisected, and some line is added to it on a line, the square from the whole with the added line and that from the added line, both squares together, are double the square from half and the square from the line composed from the half and the added line described up as from one line. Prop. 11: To cut the given straight line so that the rectangle enclosed by the whole and one of the segments is equal to the square from the remaining segment. Prop. 12: In obtuse-angled triangles the square from the side subtending the obtuse angle is larger than the squares from the sides enclosing the obtuse angle by twice the rectangle enclosed by one of sides about the obtuse angle on which the perpendicular falls and the line outside that’s taken away by the perpendicular at the obtuse angle. Prop. 13: In acute-angled triangles the square from the side subtending the acute angle is smaller than the squares from the sides enclosing the acute angle by twice the rectangle enclosed by one of the sides about the acute angle on which the perpendicular false and the line inside that’s taken away by the perpendicular at the acute angle. Prop. 14:: To construct a square equal to the given rectilinear the figure. ὀρθογώνιον can be translated ‘right-angled’ (so my translation in Elements I), ‘rectangular’, ‘rectangle’, but these are essentially synonyms as far as the Greek is concerned, with ‘rectangle’ short for ‘rectangular thing’, which in context will be short for ‘rectangular parallelogram'. In this translation, I shall switch between 'rectangle' and 'rectangular'.